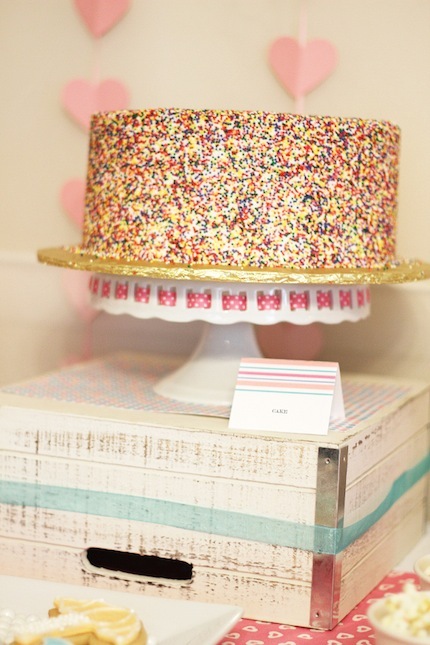 Sprinkle Baby Shower Theme Ideas! Pink hearts and colorful sprinkles! Adorable Sprinkle Baby Shower Ideas: Missy and Kristen, from sweetly chic events, bring alive a sparkling baby shower, “Sprinkled with Love.” If little specks of glitter and glam can brighten up this festive occasion so well, one can only imagine the sparkly joy once the honored baby makes her debut. 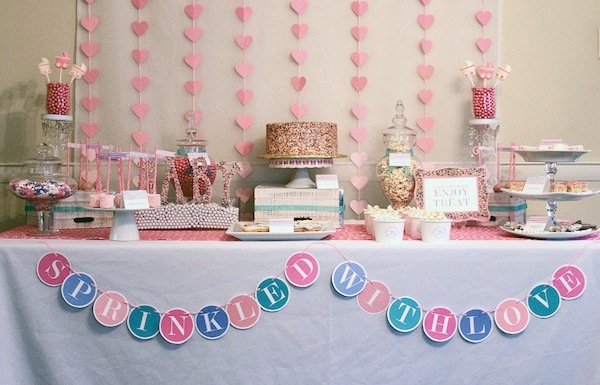 A simple banner writing out the theme hangs in front of the dessert table. For those wishing for a bit more shimmer to the sign, consider adding sparkly hearts with glitter gel pens of your choice. The pastel theme of the table cloth and background keep everything balanced with the shiny sprinklings on the finer details of the snacks and desserts as well as the center pieces. 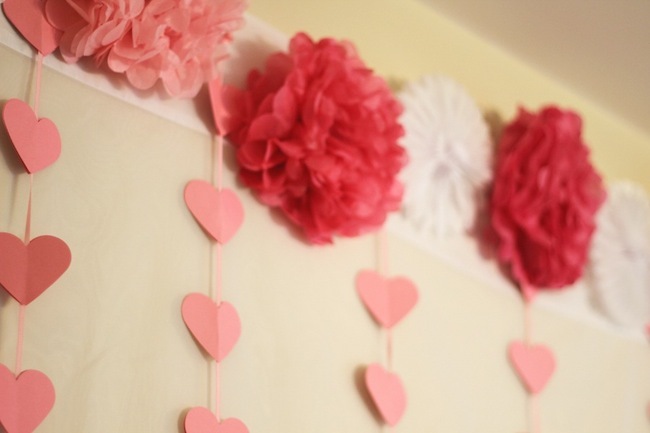 This includes the pink table cloth with white hearts-simple yet adorable! The light pink, dark pink and white flowers are absolutely gorgeous behind a banner of white. Paper flowers can have different styles or same. Here the light and dark pink flowers are the same type while the white ones are of another type! Little consecutive heart floaters hang down vertically. The word “Baby”, spelled out in sprinkled cursive letters, hangs atop a rectangular container filled with white marbles or white candy pieces. If the baby’s name is decided, consider writing the baby’s name out instead. This baby theme had many mouth-watering desserts that would tempt even the strictest dieters. 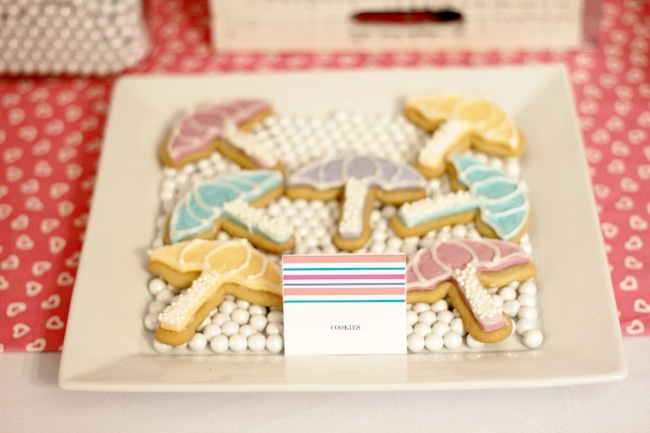 Consistent with the theme of sprinkling with shower, consider serving umbrella cookies. However, I doubt they prevent from getting showered in the sprinkle down pour-not that we’d want to. Little candy pieces line the tray. The cookies are decorated with umbrellas in different pastel colored frosting, with the handle made of sparkly white pearls! More cookie designs- oreo cookies are frosted with the party theme colors of pink and white. Alternating streaks of pink and white on top of the frosting are perfected with pearly sprinkles! This two-tray center piece also has decorated rice krispies in the bottom tray, with multi-colored sprinkles! A white cake with endless sprinkles on top. YUMMY! The cake stand is raised above all other menu items by resting on top of a stationary box. 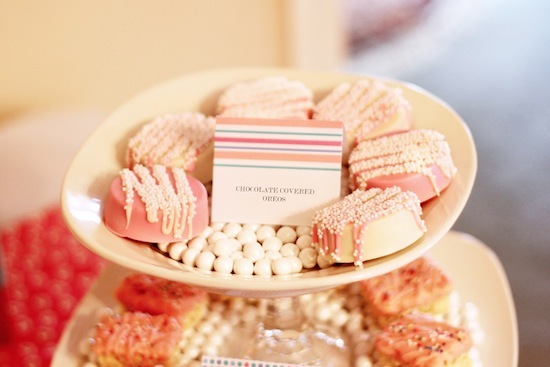 This is a perfect way to emphasize the focal points of the baby shower. A golden cake stand helps to brighten and emphasize the key dessert even more! Thank you Missy and Kristen. 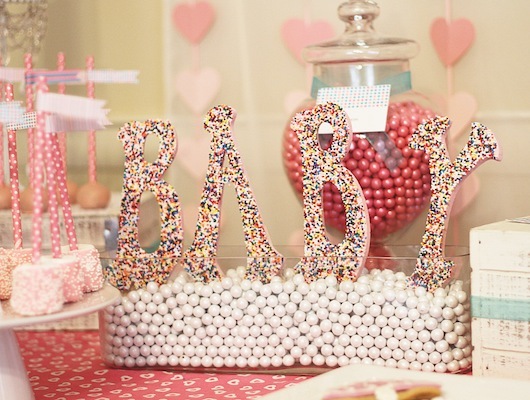 This bedazzling baby shower keeps guests mesmerized and entertained. To view more wonderful ideas and creations by the two, visit http://sweetlychicevents.com. 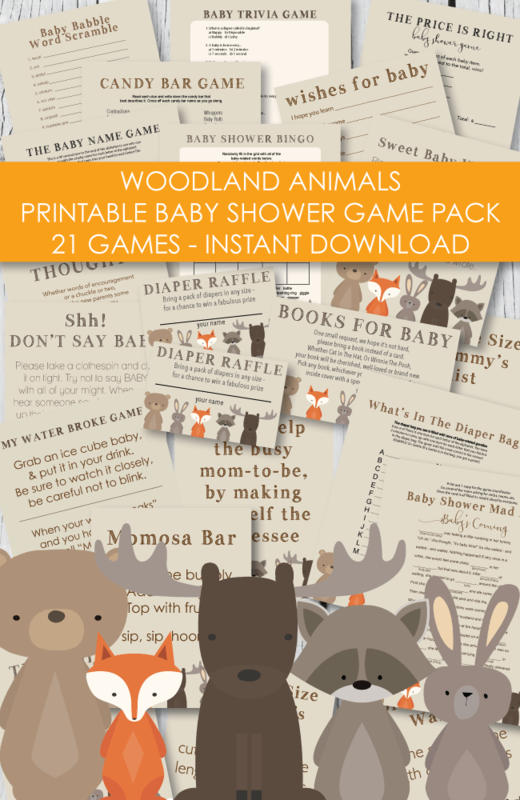 This baby shower theme can be used in a regular baby shower or you can use it for hosting a "baby shower sprinkle" - if you are not familiar with baby shower sprinkles, it is simply a toned-down version of a baby shower. Usually thrown for a 2nd or 3rd child, where the mom may not need all of the big items that are needed for a 1st child. Gifts given at a sprinkles usually consist of diapers, clothes, books and the basic baby necessities. I need some ideas for a "sprinkles" themed shower by Eileen I am hosting a "baby sprinkle" for my daughter who is expecting her 2nd child. I made the invitations, there is a cupcake with sprinkles on the front, and sprinkles all around the inside wording. I made a diaper cake, using cute ribbon with cupcakes with sprinkles on them. I'll be doing cupcakes instead of a full size cake. I have no other ideas, for the decorations or favors. I do have a lot of baby jars that I am hoping to be creative with, but I'm stumped!!! Any ideas out there? You can hang an umbrella from the ceiling over the main table and stream little cut out paper raindrops (using fishing line) from the umbrella to make it look like it is raining. Another cute idea for rain drops is to thread little white pom poms (found at crafts stores) onto clear fishing line - leaving space in between each one by tying a knot in the line. hang from the umbrella or ceiling. You can turn your baby food jars into cupcakes! Stuff white stockings and glue to the lids, and a few beads to resemble sprinkles and then trim the sides of lid with ribbon. Fill your jars with candy or bath salts, set them on a tray inside cupcake liners!